The funeral of Leicester City's owner who died in a helicopter crash outside the club's stadium is under way. Royal soldiers, monks and Vichai Srivaddhanaprabha's relatives took part in a procession ahead of the ceremony at a temple in Bangkok, Thailand. Jonathan Head, the BBC's South East Asia correspondent, is at the temple and said the ceremony was being held behind closed doors. 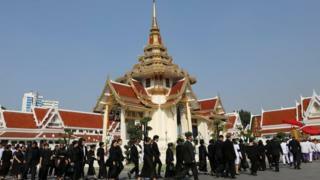 "You will see during the funeral artefacts given by King Vajiralongkorn - a special funeral urn and also a five-tiered umbrella that is very high status - being used," he said. He added: "People will watch the funeral in many ways to see how well thought of Vichai was. "He was a successful businessman, but sometimes controversial."